If you know us well, you know we love it when we can make something appear fancy with little effort! We are totally in for that! 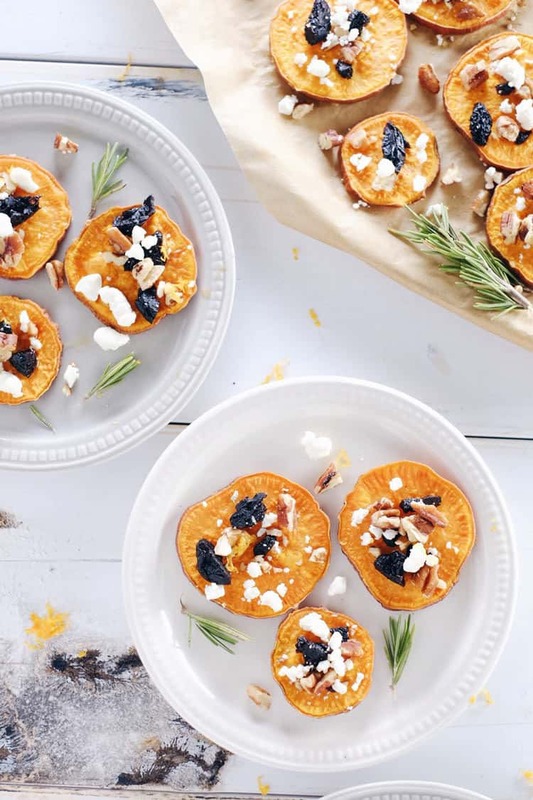 These roasted sweet potato bites are exactly that, which makes them the perfect appetizer for all of your holiday gatherings! Seriously though, the hardest part is slicing the sweet potatoes into rounds, and it’s not even that hard. Just make sure you cut them all pretty close to the same thickness so they cook evenly. Then, all you do is coat them in avocado oil, season with sea salt and cook them in the oven for about 20-25 minutes until they’re tender. While they’re cooking, roughly chop dried cherries and pecans. Pull them out of the oven when they’re done and top with the chopped items and goat cheese. Boooya! I know, you’re thinking goat cheese isn’t Paleo, and you are correct. So, if you are strictly Paleo and dairy-free then just skip the cheese. They’re still really yummy! If you can tolerate the cheese though, go for it! It is a great way to indulge during the holidays and honestly, a pretty clean way to indulge, so live a little! Why not?! 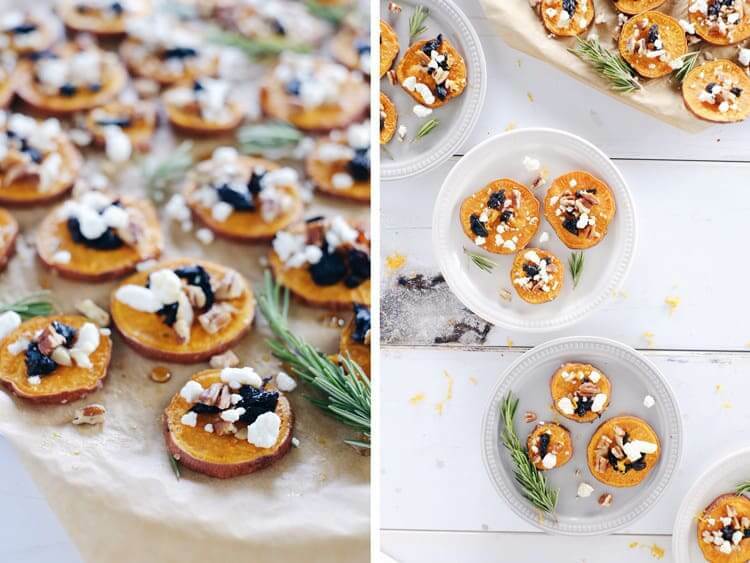 Alright, I’m sure your calendar is already packed with holiday parties and festivities, so just plan to take these roasted sweet potato bites as your contribution, and get ready to impress your friends! Let the compliments start rolling in! Let us know how it goes by leaving a comment below. Take some photos too, and tag us on Instagram @realsimplegood, so we can check it out! Slice sweet potatoes into 1/4 inch rounds and place in a mixing bowl. Once all the sweet potatoes are sliced, add avocado oil and sea salt to bowl. Toss to coat. Spread out rounds on parchment lined baking sheet in an even layer, and place in the oven to bake for 20-25 minutes, until the potatoes are tender. While the potatoes are cooking, roughly chop dried cherries and pecans and zest an orange. 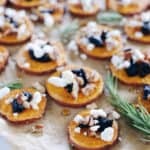 Once sweet potatoes are tender, remove from oven and top with chopped dried cherries, pecans, goat cheese and orange zest. Then, make magic happen and drizzle a little maple syrup over them if you're feeling daring. Serve these babies up! Enjoy! Note: You can also leave out any of the optional ingredients noted above. 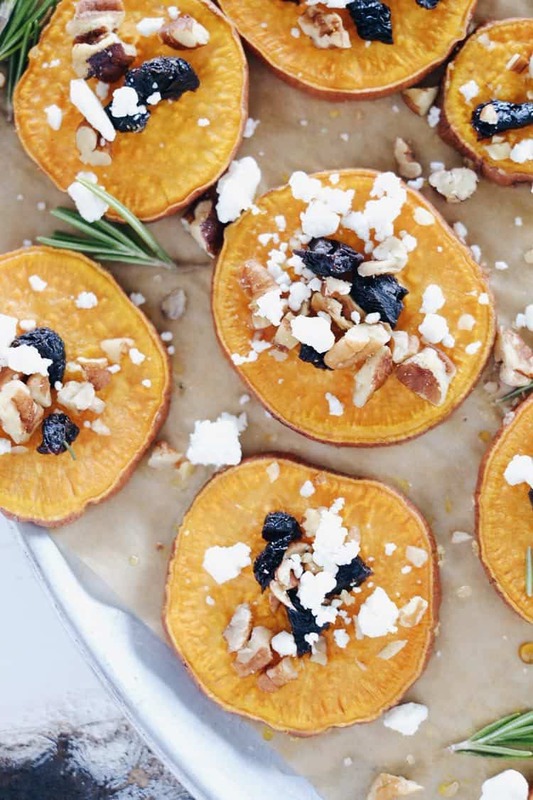 These sweet potato bites sound and look like the most perfect appetizer for the holidays! I love the satisfaction knowing that this recipe taste gourmet but it is super easy to make! Right?! Super simple, yet totally feels and looks fancy! Doesn’t get much better, especially around the holidays! Thanks friend!